Former U.S. Air Force captain Dale Brown is the author of several best-selling military-action-aviation-adventure novels: Flight of the Old Dog (1987), Silver Tower (1988), Day of the Cheetah (1989), Hammerheads (1990), Sky Masters (1991), Night of the Hawk (1992), Chains of Command (1993), Storming Heaven (1994) and Shadows of Steel (1996). Dale's novels are published in 11 languages and distributed to over 70 countries. Dale was born in Buffalo, New York on November 2, 1956. He graduated from Penn State University and received an Air Force commission in 1978. He was a navigator-bombardier in the B-52G Stratofortress heavy bomber and the FB-111A supersonic medium bomber, and is the recipient of several military decorations and awards including the Air Force Commendation Medal with oak leaf cluster, the Combat Crew Award, and the Marksmanship ribbon. He flew over 2500 hours in various military tactical and training aircraft from 1978 to 1986 and was also a graduate of the U.S. Army Airborne School. Dale is a volunteer pilot for AirLifeLine, a non-profit national charitable medical transportation organization who fly needy persons free of charge to receive treatment. He also supports a number of organizations to support and promote law enforcement and reading. He is a member of the Airplane Owners and Pilots Association, The Writers Guild, and a Life Member of the Air Force Association and U.S. Naval Institute. He is a multi-engine and instrument-rated private pilot and can often be found in the skies all across the United States, piloting his Piper Aerostar 602P. On the ground, Dale enjoys tennis, scuba diving, and hockey. He lives in Incline Village, Nevada. 1994-04-09. New. Ships with Tracking Number! INTERNATIONAL WORLDWIDE Shipping available. Buy with confidence, excellent customer service! 1994-08-01. New. Ships with Tracking Number! INTERNATIONAL WORLDWIDE Shipping available. Buy with confidence, excellent customer service! 1993-03-07. New. Ships with Tracking Number! INTERNATIONAL WORLDWIDE Shipping available. Buy with confidence, excellent customer service! 1993-06-01. Good. Ships with Tracking Number! INTERNATIONAL WORLDWIDE Shipping available. May not contain Access Codes or Supplements. May be ex-library. Shipping & Handling by region. Buy with confidence, excellent customer service! Berkley. MASS MARKET PAPERBACK. 0425142078 New Condition. . New. 1994-08-01. Good. Ships with Tracking Number! INTERNATIONAL WORLDWIDE Shipping available. May not contain Access Codes or Supplements. May be ex-library. Shipping & Handling by region. Buy with confidence, excellent customer service! 1994-04-09. Good. Ships with Tracking Number! INTERNATIONAL WORLDWIDE Shipping available. May not contain Access Codes or Supplements. May be ex-library. Shipping & Handling by region. Buy with confidence, excellent customer service! 1993-03-07. Good. Ships with Tracking Number! INTERNATIONAL WORLDWIDE Shipping available. May not contain Access Codes or Supplements. May be ex-library. Shipping & Handling by region. Buy with confidence, excellent customer service! HarperCollins Publishers Ltd, 1994-09-26. Paperback. Used:Good. Harper Collins Publishers, 1993. 1cm tare to front cover, inscription to owner on inside front end page. First Edition. Hard Cover. Very Good/Very Good. 8vo - over 7¾" - 9¾" tall. Berkley. MASS MARKET PAPERBACK. 0425142078 Like New Condition. . Fine. E Rutherford, New Jersey, U.S.A.: Putnam Pub Group, 1993. 1st Edition . Hardcover. New/New. 8vo - over 7¾ - 9¾" tall. Correct number line sequence, no writing, marks, underlining, or bookplates. No remainder marks. Spine is tight and crisp. Boards are flat and true and the corners are square. Dust jacket is not price-clipped. This collectible, " NEW" condition first edition/first printing copy is protected with a polyester archival dust jacket cover. Beautiful collectible copy. New York, NY, U.S.A.: G. P. Putnam's Sons, Inc. 1993. Hard Cover. Fine/Fine. 8vo - over 7¾" - 9¾" tall. Collectible first edition. When a volatile Russian leader tries to reclaim the former Soviet republics, Lt. Col. Daren Mace finds himself back in the cockpit of the sleek RF-111G "Vampire" bomber with Rebecca Furness, the military's first woman combat flier. Now Mace and Rebecca are in danger of being pulled into a war beyond borders . . . both professionally and personally. A critically acclaimed bestseller from a master thriller writer. 479 pages. Bottom of spine slightly bumped..
Berkley. Mass Market Paperback. 0425142078 Please allow 4 - 14 business days for Standard shipping, within the US. Thank you for supporting our small, family-owned business! . New. 1994-05-01. Reprint. Berkley. Mass Market Paperback. 0425142078 Please allow 4 - 14 business days for Standard shipping, within the US. Thank you for supporting our small, family-owned business! . Fine. 1994-05-01. Reprint. Putnam Adult. Hardcover. 0399138226 New Condition *** Right Off the Shelf | Ships within 2 Business Days ~~~ Customer Service Is Our Top Priority! - Thank you for LOOKING :-) . New. Berkley, 1994-05-01. Paperback. Very Good. Nice looking book, has minor edge wear. Putnam Adult, 1993-07. Hardcover. Very Good. Nice looking book, has minor edge wear. New York: G.P. Putnam's Sons, 1993. 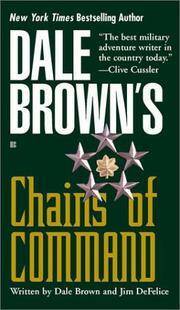 With "Chains of Command", Dale Brown delivers his most provocative and explosive novel to date : A gripping story about the future of the U.S. Air Force and new political and military realities - and a world still poised for war. Map illustrated eps. Illustrated price-intact dust jacket. A very nice copy.. ISBN: 0-399-13822-6. First Edition. Hard Cover. Fine/Near Fine. Military Fiction + US Air Force Fiction + Technology Thriller. Catalogs: Military Fiction. Berkley. Mass Market Paperback. 0425142078 Please allow 4 - 14 business days for Standard shipping, within the US. Thank you for supporting our small, family-owned business! . Fair. 1994-05-01. Reprint. New York: Putnam's Sons, c1993. First Printing. very good, very good. 25 cm, 479, maps (some in color), acid-free paper. NEW YORK: PUTNAM, 1993. DALE BROWN IS ONE OF THE FINEST, MOST POPULAR AND MOST COLLECTABLE OF MODERN DAY AUTHORS....NOT ONLY ARE HIS BOOKS A GREAT READING EXPERIENCE BUT NICE SIGNED FIRST EDITIONS ARE QUITE COLLECTABLE AND A GOOD INVESTMENT IF PURCHASED AT A REASONABLE....AND THIS IS CERTAINLY A LESS THAN REASONABLE PRICE OF THIS VOLUME......CHAINS OF COMMAND...BEAUTIFUL FIRST IN DJ AND SIGNED BY THE GREAT DALE BROWN. SIGNED BY DALE BROWN. First Trade EDITION. HARDBOUND. Very Good TO NEAR FINE/Very Good TO NEAR FINE. OCTAVO. DALE BROWN. New York: G. P. Putnam's Sons. Near Fine in Near Fine dust jacket. 1993. First Edition; First Printing. Hardcover. 0399138226 . First edition/first printing in Near Fine condition, minor soiling in alike dust-jacket; . Putnam Adult. Hardcover. 0399138226 First edition, First Printing. Signed by the author on the title page. Not inscribed, price clipped or otherwise marked. Securely wrapped, dust jacket in protective cover and shipped in a box. Full # line starting with a 1. NearFine/Fine Light bumping . Very Good. New York: Putnam, 1993. Hardcover. Fine/Fine. First edition. Fine in fine dustwrapper. Please Note: This book has been transferred to Between the Covers from another database and might not be described to our usual standards. Please inquire for more detailed condition information. New York: Putnam, 1993. Hardcover. Near Fine/Near Fine. Second edition. Near fine in near fine dustwrapper. Very slight spine lean. Please Note: This book has been transferred to Between the Covers from another database and might not be described to our usual standards. Please inquire for more detailed condition information. NEW YORK: G.P. PUTNAM'S SONS, 1993. This book has been signed by the author, Dale Brown in black ink on the first title page. The signature reads: "Never Surrender! Dale Brown. . . May '95". The book is in fine condition and is nearly 500 pages long. The front of the dust jacket features an illustration of a plane and an explosion.. SIGNED BY DALE BROWN. First Edition. HARDBOUND. Fine/FiNE. OCTAVO. FICTION. US: Putnam Adult. Hardcover. 0399138226 * Fine in Fine dust jacket. First edition. books carefully packed and shipped promptly . Fine. 1993. New York:: Putnam,, (1993.). Fine in fine dust jacket.. First printing. The seventh techno-thriller by this former Air Force captain. Clive Cussler called Brown "the best military adventure writer in the country today." 479 pp. Map endpapers. New York, NY: G. P. Putman's Sons. Very Good in Very Good dust jacket;. 1993. First Edtion. Hardcover. 0399138226 . Small 4to - 9" to 11" tall; 479 pages; Very minor shlef wear to the DJ edges. Book clean and solid. .
New York: G. P. Putnam's Sons, c1993. 1st printing. Hardcover. Very good condition very good d.j./good. 479p. Condition: Very good condition very good d.j. NEW YORK: G. P. PUTNAM'S SONS. G/VG DJ IN MYLAR WRAP. SPINE LIGHTLY CREASED, LIGHTLY COCKED. Pages: 479. . 1993. 1ST. HARDCOVER.. Condition: G/VG DJ IN MYLAR WRAP. SPINE LIGHTLY CREASED, LIGHTLY COCKED. Pages: 479. G.P. Putnam's Sons, 1993. Later printing. Near fine in fine dust jacket in mylar cover. Condition: Near fine in fine dust jacket in mylar cover. Putnam Adult. Hardcover. 0399138226 First edition, First Printing. Signed by the author on the title page. Not inscribed, price clipped or otherwise marked. Securely wrapped, dust jacket in protective cover and shipped in a box. Full # line starting with a 1. F/F Book has a former owner notation on free end paper. . Fine. Putnam Adult. Hardcover. 0399138226 SIGNED American first edition, first printing. Signed on the inside title page by author. Published by Putnam in 1993. Contains numberline 1 2 3 4 5 6 7 8 9 10. Virtually no wear to jacket. Jacket is NOT price clipped. Covers are clean and bright. Edges are sharp. No tears or creases. The book itself is in Fine condition with no bumps or marks. The binding is straight and tight. NO remainder mark. All books are marked down 35% until February 1, 2019. Start stocking up now! . Fine. 1993. First Edition. New York: PUTNAM, 1993. Book. N-Fine. Hardcover. First Edition/First Printing. A square solid tight carefully read copy. This copy has some veryyyyyyyyyy minor pagedge soil else fine.. THIS COPY IS IN MY POSSESSION AND NORMALLY SHIPS NEXT DAY..
E Rutherford, New Jersey, U.S.A.: Putnam Pub Group, 1993. Book. Near Fine. Hardcover. 1ST. An Excellent Copy - A First Edition, First Printing. Book Is In Near Fine Condition. Boards Are Clean, Not Bumped. Fore Edges Have A Tiny Bit Of Shelf Wear. Interior Is Clean And Legible. Not Remaindered. Dust Jacket Is In Near Fine Condition. Not Chipped Or Crinkled. Not Price Clipped. Dust Jacket Is Covered By Mylar Brodart. Thanks And Enjoy..
Beverly Hills, CA, U.S.A.: Dove Audio, 1993. Audio Book. Audio Book On Cassettes. Very Good (tapes)/Good (Box). Culp, Robert (Reader). Brief summary of content available on request by e-mail. Abridged audio book on 4 cassettes. Running time 6 hours. Berkley. Used - Very Good. Mass Market pb. Very good condition; edges, corners, and covers of book show minor wear. No underlining; no highlighting; no internal markings. Stored in sealed plastic protection. In the event of a problem we guarantee full refund. 1994. Mass Market pb. Berkley. MASS MARKET PAPERBACK. 0425142078 *LIKE NEW* Ships Same Day or Next! . Fine.